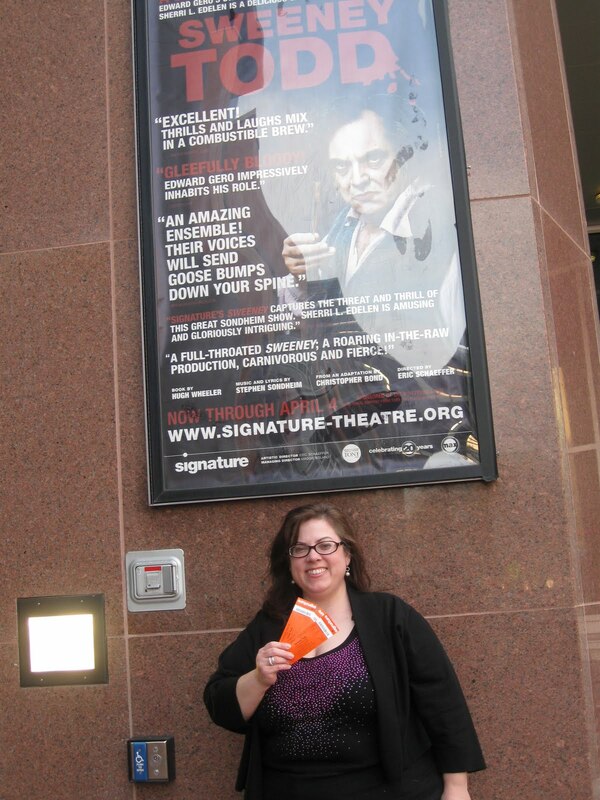 I saw Sweeney Todd at the Signature Theatre in Arlington, VA on April 4th. I still haven't recovered from the experience. It's no secret that I have a distinct fondness for Sweeney Todd. My expectations were high, even for this regional production. 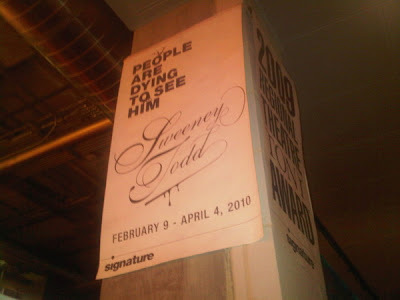 I had anticipated going since Signature announced their season over a year ago. When they finally announced casting, I found myself feeling disappointed that some big New York names were included. But I needn't have felt anything but sheer excitement. 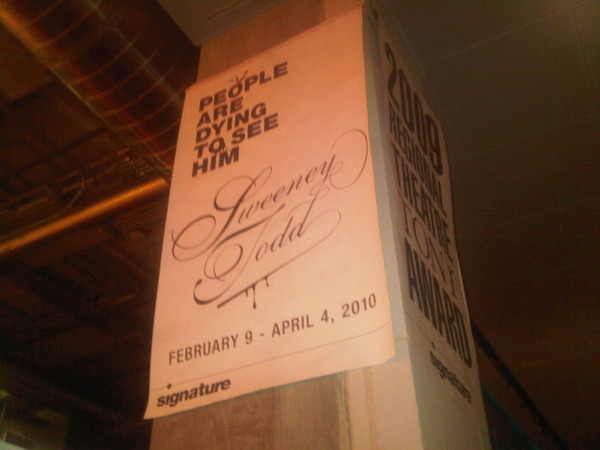 Eric Schaeffer, the artistic director of Signature, directed this production. I felt like he really understands this masterpiece and crafted this production lovingly. He made it a period piece, capturing all of the best elements from the original production while throwing in a little of the John Doyle revival just for an added thrill. From moment one, as we walked in the theatre, chills were running down my spine. My seatmates seemed to be feeling the same way the entire time - Wanda, was wringing her hankie in her lap, while Chelsea was gasping and clasping her hand to her mouth. The entire audience seemed rapt in awe and horror. The houselights were dimly lit even before overture began. Eeire sounds were coming from the speakers - sort of dripping, perhaps screaming. It really set the tone. Chris Lee's lighting was beautiful and foreboding. James Kronzer's set was industrial, cold metal with much of the chorus was often up above on sort of a cat walk, as if taking it all in, not able to look away. The orchestra was fantastic, even though only comprised of piano, woodwinds, cello and percussion. Orchestrated by Zak Sandler, it sounded much like Sarah Travis' in the recent John Doyle production - simple but still true to Sondheim's score. Mrs. Lovett's home and the barbour shop above was very similar to the original Broadway production. She had her dough, rolling pin and harmonium. The meat grinder was a cement mixer, giving the act an even more stomach turning affect. An elevator, which delivered Sweeney to the scene of the crime, doubled as Mrs. Lovett's oven, and smoke and red light oozed from its seams. A real barbour chair was used, as was an ample amount of stage blood. Every time Sweeney would slit another throat, blood would very realistically pour and the victim would slide down into Lovett's house. Kathleen Geldard managed the costuming fine, making everybody look zombie like, except for Anthony and Johanna who were costumed traditionally. Edward Gero was Sweeney and Sherri L. Edelen was Mrs. Lovett. Gero was menacing, brooding, terrifying. Edelen was always on the edge of madness and death. They were costumed and made up to look like zombies, grinding their way through their miserable lot in life. Every moment they were on stage was at once terrifying and thrilling. Their chemistry was terrific and always on the fine edge of manipulation and love. They sang it with grit and desperation and could not have been more perfect. The rest of the cast was fine, particularly Chris Van Cleave as Judge Turpin. He played the Judge more lecherous than I had ever seen, and took his prayer scene to the extreme limit, including self flagellation in using his belt to whip his own shirtless back. The first scene began with a bucket raining a shower of blood being pulled up to the ceiling from a grate in the floor. The final scene ended with roped, sheeted dead bodies falling from the rafters - six or so fell around the theatre while one dropped to the stage. I never saw an audience collectively jump in their seats like that. I was in theatrical heaven the entire evening - it gave me every thrill I was expecting and some that were surprising. 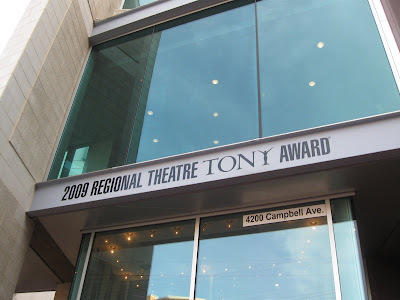 At intermission, I told Wanda that it was a good thing that I didn't see before the final performance, otherwise I would have been completely obssessed with making my way to Arlington at every chance. I'm so glad you loved it - I saw it when it first opened and was completely enthralled.